A vital transport service for Island cancer patients has been boosted by the purchase of a new Daisy Bus - and a hugely successful fundraising appeal. Grant funding has enabled Wessex Cancer Trust to buy the new vehicle and the incredible fundraising efforts of Islanders have also helped to ensure it is now funded well into 2020. Funding cuts in 2017 had posed a threat to the service, which transports Islanders to their Portsmouth hospital appointments for free. 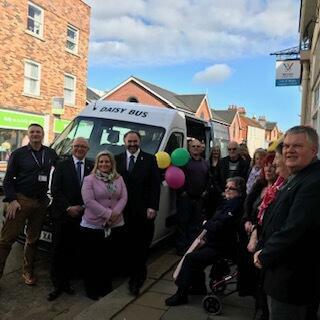 To celebrate the arrival of the new vehicle and the success of the appeal, the charity hosted a thank-you event for all supporters on Wednesday (February 20th) 2019 at the charity’s support centre in Lugley Street, Newport. Those attending included Island businesses and organisations that have been heavily involved in protecting the service. Among them were the Island’s Freemasons and the IW Prostate Cancer Support Group, who raised thousands towards the appeal, and Hovertravel, which donated 10% of its ticket fares from patients travelling across the water. The new bus, which was funded by grants from the Clothworkers’ Foundation and Football for Cancer, was also at the event.